After five months at sea, Christopher Columbus landed his ship the Santa Maria at San Salvador on 12th October 1492. Columbus had set sail from Spain hoping to find a short cut across the Atlantic Ocean to Asia, but instead found himself in a new world, and lauded as the ‘discoverer of America’, even though at the time the explorer remained convinced that he had found Asia. The fact that the Taíno people were already well established in the Caribbean recalls to mind Ron Moody who said; ‘The thing about discovery is that it was there all along’. In fact, the notion that Columbus was the first European to discover the Americas beckons dispute – a Viking settlement was founded in the north of the continent some five centuries earlier. By December, Columbus reached the Island known to the native Taíno tribe as Kiskeya. Much to their dismay, he renamed it Hispaniola after his homeland. After returning to Spain, Columbus launched a second expedition the following year, with the intention of establishing permanent colonies under Spanish rule. On his return to Hispaniola, legend has Columbus sailing up the River Ozama and mooring the Santa Maria to a large Kapok tree (Ceiba pentandra), on the western bank of the river. It was here in 1496 that Christopher’s brother Bartholomew founded Santo Domingo, the oldest city in the Americas, following the discovery of gold. The Taínos suffered from the new migration however. Their population was decimated both by introduced disease against which they had no immunity, and genocide at the hands of the Spanish. A Dominican superstition holds that it is unlucky to mention Christopher Columbus by name. Instead, they often refer to him simply as the Admiral. The Columbus Tree survived as a venerated shrine until the early twentieth century, by which time it had reached huge proportions. 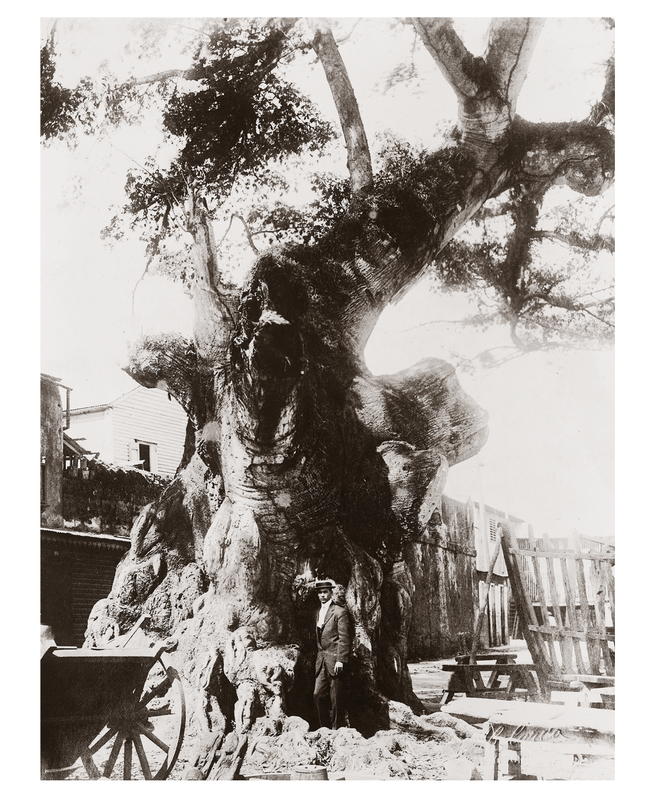 It was pruned heavily in the 1920s due to decay, and a piece of its timber – known as balm wood by the Taínos – was presented to Mariners Bank in 1928. A new tree was planted, and has grown into a large, healthy specimen beside the stump of its slowly decaying parent.